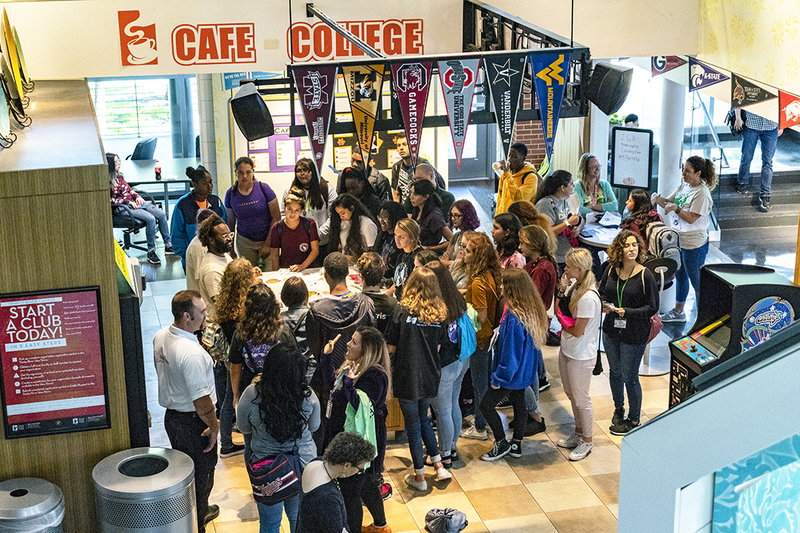 More than 700 high school students, college students and citizens learned what it was like to be hearing-impaired in Travel into Deaf, Deaf World on TR Oct. 4. Fifty-four volunteers helped with 14 different spots to “travel to” in the deaf world, including a mock hospital, a pharmacy, an eye doctor and jail. In all of these places, no one was allowed to speak. TR adjunct sign language instructor Sara Arrington conducts the deaf culture class during the Travel Into Deaf, Deaf World event Oct. 4 where attendees took a slideshow pre-quiz to test their knowledge of deaf culture. They wanted students to be aware of the important aspects of deaf culture, Sheppard said. Even if a person knows little about American Sign Language, there is so much to learn from this event, she said. “We had a really good turnout this year,” said Cece Garrett, the lead event planner and a full-time instructional assistant in the ASL lab. Three rooms were added this year because they were “wall to wall” last year, she said. She noticed deaf students were glad to see everyone signing at the event. “They seem to have a high sense of hope,” she said. 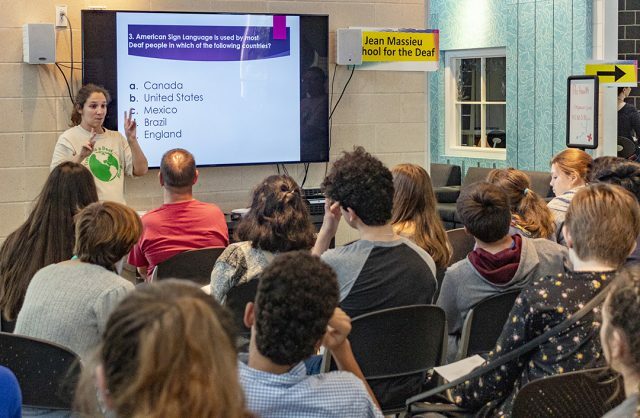 TR students and visiting high schoolers learn more about American Sign Language at a presentation during the event Oct. 4 on TR. The event allowed students who can hear to understand how deaf people navigate the world every day and practice not using their voice. 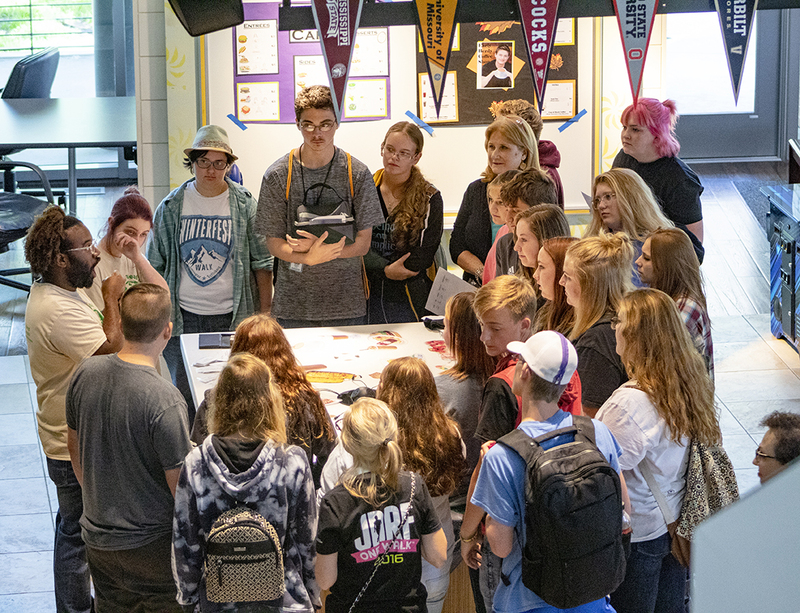 It also gave ASL students a chance to meet deaf and deaf-blind persons and to inform a little bit about interpreting, which is what the TR program does to help build pathways. Iridian Bravo, who is deaf, has been a volunteer for two years.